The Ordinary have continued to disrupt the beauty industry with a foundation that costs less than £10 and is available in 21 shades. There are two formulas each with SPF15. A serum foundation which is lightweight and a full coverage which has a high level of pigmentation. Despite the small bottle you get the standard 30ml of product. The packaging is sturdy and functional. It does not look beautiful on your dressing table but it is very practical if you are doing your makeup during your commute. The Colours Foundations were launched before the Fenty Beauty launch, so now 21 shades does not seem to be all that, but earlier this year – The Colours was seen to have been a good launch. They have three shade intensities and within each intensity the shades either have a red neutral or yellow undertone. Shade 3.3N is the deepest shade and it is an outlier. Significantly deeper than 3.2R which is the penultimate shade in the range. The Colours have fallen into the trap that many brands do and failed to provide those of us with the deepest skin tones with a even gradient of shades. I can wear 3.2R or 3.2N but I really wish that the brand had taken the time to create more shades and fill in the gaps. I am a fan of cake face. My go to foundation formula is stick and I enjoy the plastic fantastic look. However, The Coverage Foundation is full coverage and if not applied appropriately for your skin type you get a very ‘made up’ look. Fine for Instagram, but not so good when you are on a number 73 bus. t wears nicely on the face, but because it is so full coverage, it is difficult to wear powder over it as you can look super cakey. I get a bit of oil peeking through after four hours and a blotting paper is better than powder. Overall I do enjoy this foundation; it is long lasting on the skin and does not make any texture you have look worse. The price means you can afford to buy two shades to blend if they don’t have your shade. This is a functional product so if you are looking to adorn your dressing table with a gorgeous bottle this is not the brand for you. If you can find your shade and it has not sold out, it is worth a try. 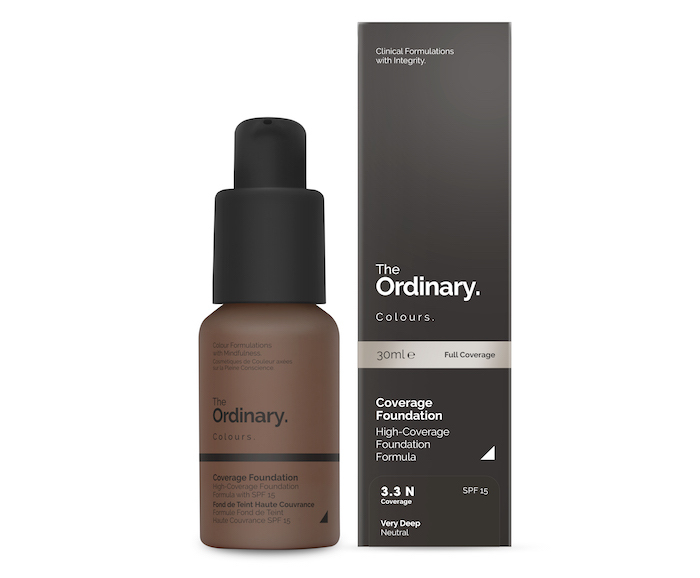 The Ordinary Coverage Foundation is priced at £5.90.